Welcome to the April celebration dedicated to emerging and developing readers! 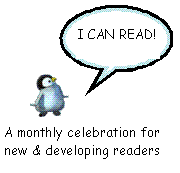 This month we are hosting the I Can Read Feast for New Readers here at Family Bookshelf. For the next three days we will be talking about easy reader and short chapter books. In the days to come, stop back by to find book reviews for easy reader, short and illustrated chapter books, as well as tips and ideas for nurturing the developing bookworms. I’m going to kick us off with a little bit different idea: using a bilingual picture book as an easy reader. If you’ve got reviews of picture books that can double in this category or a review of a traditional easy reader, be sure to add it to our comments our InLinkz collector. I’ll pull them into the post as we go along. On April 30 we celebrate El Día de los niños/El Día de los libros, Children’s Day/Book Day. This is the sixteenth year of celebrating this family literacy initiative founded by author Pat Mora. We’re going to combine two celebrations into one, and offer a review of a bilingual book for emerging readers. Although many of the popular easy reader books are available in Spanish, my focus this month is on picture books that can also “transform” themselves to be an easy reader. The English and Spanish text are parallel on each page, so speakers can enjoy and practice reading the story in their native language. It will introduce many readers to a cultural tradition they may not be aware of. Summary: Don Pedro has been working in the kitchen all day sculpting buildings, horses, and knights for his entry in the contest for the Night of the Radishes (December 23). As he is working on the last radish, it jumps from his hand, refusing to be carved for the contest. He has other plans … and he isn’t about to let Don Pedro, a burro, or even the local merchants get in his way. My thoughts: Colorful images, humor, and a happy ending come together in this picture book that introduces kids to a Mexican holiday. Although the chorus may remind you of The Gingerbread Man, the story is unique, as everyone who played a role in trying to catch the runaway radish benefits from their effort. The illustrations are colorful and full of expressive characters and plenty of activity. [amazon_link id=”B007SKCVL6″ target=”_blank” container=”” container_class=”” ][/amazon_link]There is nothing unique about this book. It follows the Diego formula to a T. Diego hears an animal in trouble, used Click the Camera to find them, then helps them out. But that is what is so good about this book. The familiarity helps kids understand the context for reading. There are a variety of words symbolized by small pictures in the text. When you see a picture of three bees, the child is supposed to say the word “buzzing bees” and the parent reads the rest of the sentence. [amazon_link id=”1426309112″ target=”_blank” container=”” container_class=”” ][/amazon_link]I can’t believe I have never reviewed one of National Geographic’s utterly cool nonfiction easy readers before, but according to my post listing I have not. Oh the horror! So, I discovered these last year and they have instantly, crazily successful at my library. Kids, and parents, have figured out to look for the yellow spine and I have made a list of all the titles we own, they get asked for that often. There are so many reasons I love these, but the top three are: nonfiction for younger readers, amazing photographs, and text that is challenging but in a large font and enticing to read. As Jen pointed out, many cultures have a “radish story,” suggesting that it is quite an important crop! Taking that a step further, folktales are a wonderful way to engage developing readers because the stories are often familiar and usually have elements of action and humor that keep them going. One of my grandsons (age 6 years 8 months) has never been keen on reading. He is in the top reading group at school so it isn’t a matter of not being able to read, but of finding other activities more interesting. [amazon_link id=”B0057D90GU” target=”_blank” container=”” container_class=”” ][/amazon_link]I have found that books engage him when they include problems and puzzles, for example, Graeme Base’s The Legend of the Golden Snail (Viking Penguin, 2010). This book has the added attraction of being linked to the author’s website which offers the opportunity to make the snail come to life – fascinating! My grandson’s interest in puzzles extends to jokes and riddles so Duncan Ball’s ‘Selby’s Joke Book’ (Angus & Robertson, 2000) and other books featuring the animal proclaimed by the author to be Australia’s only talking dog, are current favourites. This book looks good! I love bilingual books! It’s strange, but almost every language I know has a radish-related story! Must be a very important crop. Jen Said “[Radishes] must be a very important crop.” and that got me laughing! I don’t think I ever thought about radishes as a universal vegetable! Clearly it has lots of folktale value, if not nutrients! Thanks for stopping by, Jen.